Supreme Court judge, Justice SA Bobde on Monday gave due recognition and appreciation to the women members of the Constituent Assembly, asserting that these women “are usually not given enough credit for their participation”. 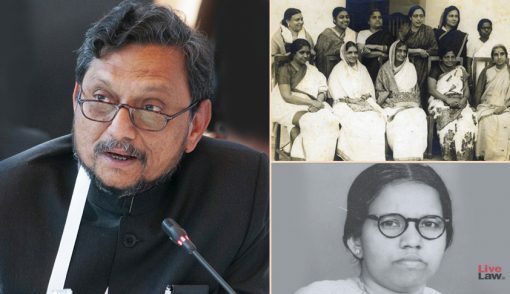 Justice Bobde, who would be succeeding the CJI, was speaking at the occasion of Constitution Day, when he named the fifteen women: (i) Ammu Swaminathan; (ii) Dakshayani Velayudhan; (iii) Begum Aizaz Rasul; (iv) Durgabai Deshmukh; (v) Hansa Jivraj Mehta; (vi) Kamla Chaudhary; (vii) Leela Roy; (viii) Malati Choudhury; (ix) Purnima Banerjee; (x) Rajkumari Amrit Kaur; (xi) Renuka Ray; (xii) Sarojini Naidu; (xiii) Sucheta Kriplani; (xiv) Vijalakshami Pandit; and (xv) Annie Mascarene. He also specifically mentioned Dakshayani Velayudhan, who was the only dalit woman in the Constituent Assembly and lauded the Constituent Assembly for being inclusive. “We must take pride in the fact that the Constituent Assembly was inclusive with regard to not just members that belonged to different social, economical and religious backgrounds but also that 15 out of 389 members in the Assembly were elected women,” he said. Justice Bobde further mentioned three other persons, who, he opined, were integral to the making of the Constitution but are not generally recognized. He said, “…first¸ S.N. Mukherjee, the Joint Secretary of the Constituent Assembly Secretariat, who was christened as “the Chief Draftsman of the Constitution” by Dr. Ambedkar. According to Dr. Ambedkar, Mukherjee had the ability to put the most intricate proposals in the world in the simplest and clearest legal form.